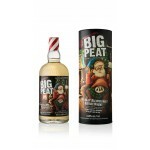 Big Peat Christmas Limited Edition 2016. For the first time ever, Big Peat feisty Ileach fisherman, encapsulates Malt Whiskies from all active distilleries on Scotland’s magical Whisky Island, plus the long-closed, elusive and exclusive Port Ellen Distillery. Some may say this is Islay in a bottle. Big Peat Christmas 2016 is bottled at Natural Cask Strength at 54.6% and without colouring or chill filtration. But what is peat needed for in whisky production, and how does the smoke flavour come into the whisky? The old Scots used peat to heat the pot stills. However, this doesn't lead to the smoky flavour of the whisky. Does the water, which runs through peat moors, influence the smokiness of the whisky? The answer is a clear NO! Peaty water contains only a few ppm (parts per million) of peat particles, which colour the water brown but don't contribute to the smoke flavour. Sure, the water is crucial for the quality of the whisky, but it doesn't influence the smokiness. Only drying the damp malt over a peat-heated fire brings the smoke into the barley grain. The level of smokiness of a whisky is determined by the time the barley grain is exposed to the pungent peat smoke during drying. Damp malt is usually dried for approximately 30 hours.